On September 21, 1908, just over four years after the establishment of the Pittsburgh-based Hero Fund, Andrew Carnegie expanded the concept to his native land with the establishment of the Carnegie Hero Fund Trust in Dunfermline, Scotland. Carnegie’s intention to export his model of honoring civilian heroes to foreign countries was revealed in a letter from him to Charles Taylor, president of the first Hero Fund. “I got the idea this morning in bed listening to the organ. Why not extend Hero Fund to my Native Land Britain & Ireland. Make the Dunfermline Trust take charge of it.” In a postscript he wrote, “Im [sic] very happy over this revelation this morning.” In the three years following its creation, he established hero funds in France, Germany, Norway, Switzerland, Netherlands, Sweden, Denmark, Belgium, and Italy. Photographs of medals courtesy of Section of Anthropology Carnegie Museum of Natural History. Carnegie Hero Fund Trust (United Kingdom) recognizes voluntary acts of heroism that have resulted in injury or death to the rescuer. The act must have been performed in the United Kingdom, Ireland, the Channel Islands, or the surrounding territorial waters. Those selected for recognition receive a framed certificate and citation, and their names are inscribed in the Hero Fund Roll of Honour, which is unique to the UK fund and kept in the Andrew Carnegie Birthplace Museum in Dunfermline. The Fund also provides financial assistance, if necessary, to heroes or to the families of those who have been killed carrying out the heroic act. Fondation Carnegie (France). In a letter dated February 9, 1909, Carnegie offered to France the gift of an initial investment of $1 million, which was intended to honor and reward those who perform acts of civilian courage, and to aid the widows and orphans of rescuers who die. French President Armand Fallières accepted the gift on July 23, 1909. 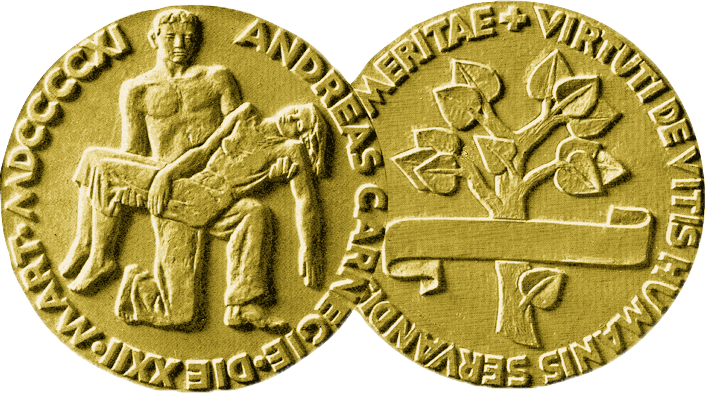 Medals of bronze, silver, and vermeil, as well as certificates, were awarded to those who deliberately risked their lives to save human life, and cash grants often accompanied the award. During its century of existence, the foundation made more than 12,000 awards. The dissolution of the foundation was approved by a decree of the Ministry of the Interior on April 19, 2011, and records of its awardees are now maintained by the National Archives of France at the above address. The remaining funds of the foundation were transferred to the Franco-American Commission for Educational Exchange, Paris. The commission, which administers the Fulbright program between France and the U.S., has initiated a Fulbright grant named for Andrew Carnegie and sponsors projects linking schools in both countries. Carnegie Stiftung für Lebensretter (Germany) was founded in late 1910 after Andrew Carnegie presented his intention to Kaiser Wilhelm II. The Kaiser acclaimed the proposal as a “noble idea” and by the end of the year gave permission for the fund’s startup. Its first meeting was held Jan. 20, 1911, and the fund operated until its takeover by the Nazi regime in 1934. No activity was recorded until 2005, when a private German citizen took it upon himself to resurrect the organization. On April 15, 2006, the first meeting of the re-formed Stiftung für Lebensretter was held, but the effort was short-lived. Carnegie Heltefond for Norge (Norway) was established on March 21, 1911. The fund grants awards to people who, on Norwegian territory, perform voluntary acts of civilian courage to save the lives of others “in peaceful pursuit and surroundings.” For a heroic act to be recognized, it must involve risk to the rescuer’s life. A board of three members who are appointed by the Ministry of Industry and Commerce governs the fund. In addition to the chair, members are the U.S. Ambassador to Norway and a Norwegian citizen. Financed by interest income, the fund awards bronze, silver, and gold medals, financial grants, and diplomas to those honored for their bravery. Awards are decided by judgment of the board, with reference, if possible, to reports and comments from the local police superintendent. Stichting Carnegie Heldenfonds (The Netherlands).In a letter dated March 23, 1911, to the Minister of Foreign Affairs, Carnegie expressed his pleasure that The Netherlands had agreed to establish the Heldenfonds. He endowed the fund with a gift of $200,000, saying that he felt the amount would “meet the cost of maintaining injured heroes and their families during disability of the heroes, and the widows and children of heroes who may lose their lives…” The Heldenfonds awards silver and bronze medals, together with a certificate. The number of heroic acts awarded has averaged 45 in recent years. The Carnegie Rescuers Foundation (Switzerland) was established on April 28, 1911, shortly after the Federal Council accepted Carnegie’s gift of $130,000. The Foundation grants awards to people who, on Swiss territory, risk their lives in peaceful endeavors to save the lives of their fellows. For an act of heroism to be recognized, the rescuer must have exposed his life or health to a real danger. Persons recognized by the Foundation receive a certificate; engraved bronze, silver, and gold medals are also awarded, as are wristwatches and monetary grants to the rescuers and their families. Young people receive a voucher for a hot-air balloon ride or a helicopter flight. Since the establishment of the Foundation, over 8,300 people have been recognized, and more than three million Swiss francs in subsidies have been paid to rescuers and their families. Awards and monetary grants are announced annually. Carnegie Hero Fund (Belgium). On April 17, 1911, Carnegie informed the Belgian government of his donation of $230,000 in government bonds, the interest of which was to be used to support heroes of peace and the families of those who lost their lives as victims of their helpfulness. The fund was adopted by royal decree on July 13, 1911. The fund awards individuals who expose their lives to serious and threatening danger for the purpose of saving the life of another human being. An extraordinary degree of selflessness, the seriousness of the danger, and the exceptional circumstances in which the acts of heroism take place are taken into account. Awards include a medal of bronze, silver, or gold, and a diploma, and in some cases, just a diploma. Financial support is also granted to relieve the material needs of destitute families, and to help finance the studies of the heroes’ children. The fund recognizes about 50 cases a year. The Fondazione Carnegie Per Gli Atti De Eroismo (Italy). In a letter dated June 17, 1911, Carnegie expressed his satisfaction that the Italian government had accepted his offer of $750,000 to establish a fund in Italy to undertake work similar to that of the hero fund in the United States. The fund was recognized under Italian law on September 25, 1911. In addition to awarding gold, silver, and bronze medals to heroes and heroines, the fund also makes monetary grants in exceptional cases. In recent years, the number of awards has averaged about 30 a year. Carnegiestiftelsen (Sweden) was established on October 6, 1911, in response to a letter Andrew Carnegie had written to the King of Sweden at the beginning of that year offering $230,000 for a hero fund. The fund awards individuals who voluntarily, or otherwise beyond what may be deemed to be their duty, have, by some gallant action in the peaceful walks of life, risked their lives in order to save human lives in the territory of Sweden and on Swedish ships. For many years, the fund offered money to those who had suffered when saving or trying to save lives, and also to the families of heroes when there was a need. Currently, the social insurance system in Sweden normally helps in such situations, and, according to the statutes of the fund, it cannot offer money if the social authorities are obliged to help. Today, the award consists of a gold watch, a diploma, and a monetary grant. Carnegies Belønningsfond for Heltemod (Denmark) Carnegie initiated the establishment of this fund on December 30, 1911, in a letter from him to King Frederik VIII. Royal Assent by the King affirmed the fund, endowed with $125,000 on February 24, 1912. It recognizes outstanding acts of selfless heroism performed in Denmark, Greenland, and the Faroe Islands, or in their territorial waters. The award consists of a diploma and 10,000 Danish crowns, or more in special cases, and in cases where the rescuers lose their lives, the fund may grant financial assistance to the surviving dependents. A medal may also be awarded in recognition of certain heroic acts. Awards are announced once a year, in December. For the past several years, the number of awards made annually has ranged from 15 to 30.